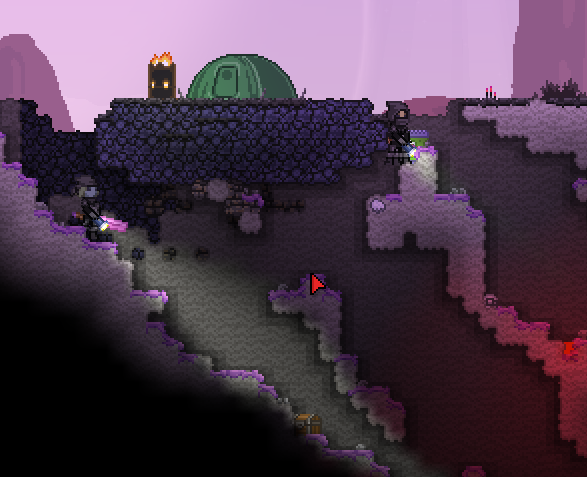 Bandits are a common encounter when exploring the vast reaches of Starbound. They are found on planets of all biomes and threat levels. A Bandit encounter consists of 1 to 3 hostile Bandits, calmly waiting by a metal crate with an oil lantern on top, until a player approaches. Upon sighting a player, any bandits will attack, often with guns, until they can close the distance for melee attacks. Bandits will often drop Pixels and the Bandit's Hat or Bandit's Hood when killed. Note that Bandits are treated as player characters, and will be attacked by (and fight back against) hostile monsters. Bandits do belong to one of the six player races, and will shout race-themed text upon sighting the player. Being the same race as the Bandits will not prevent their attack. GLITCH: Some bandits have been seen stuck in the ground or partially stuck. This page was last modified on 24 September 2016, at 00:55.